The newly-revised, 2018 Ford Mustang GT with optional Performance Pack will ship with a brand-new set of Michelin Pilot Sport 4 S tires developed specially for the Blue Oval’s latest pony car. The Michelin Pilot 4 S, introduced by Michelin to supersede the legendary Pilot Super Sport, will displace Pirelli’s P Zero as the Mustang GT’s high-performance OE tire of choice. The version of the Pilot Sport 4 S bound for the 2018 Ford Mustang GT Performance Pack has been tuned to suit the pony car’s precise handling characteristics, delivering superb dry and wet grip, reduced braking distance, and maximum lateral acceleration. 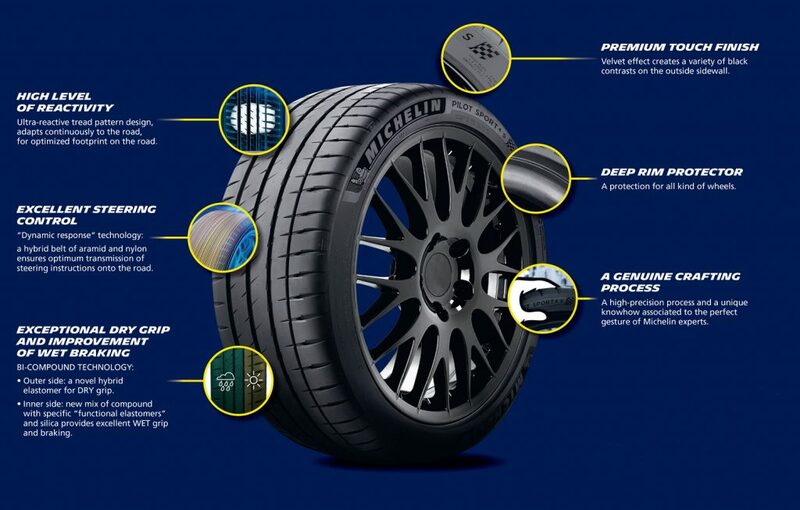 Ford says that the Mustang GT Performance Pack’s specific flavor of Michelin Pilot Sport 4 S tires has been uniquely engineered for the pony car with features like an “ultra-reactive” tread pattern, and a belt made of aramid and nylon that provides an “optimum transmission of steering input to the road.” The hybrid-elastomer outer rib delivers excellent dry grip, while the middle rib and a new inner rib with elastomers and silica provide improved wet grip.